This is just one of the fabulous dishes we had at our dinner party. 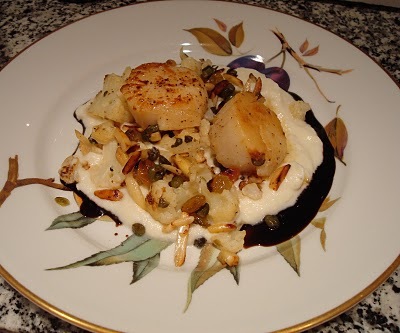 Caramelized scallops are served over a heavenly cauliflower puree with cream, finished with a swirl of balsamic reduction. Pat’s inspiration for this dish came from Chef Reddington of Redd Restaurant, Napa Valley. The cauliflower florettes are sauteed with capers, slivered almonds, and golden raisins. A delicious combination of flavors and textures. 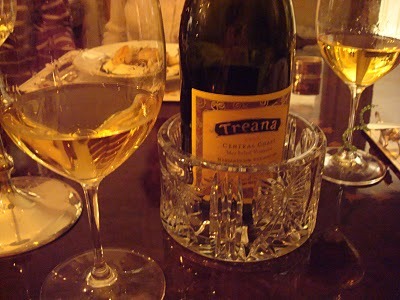 She chose Treana 2005 Central Coast 50% Marsanne 50% Viognier from the Mer Soleil Vineyard to pair with this dish. Excellent! Yum!!!! More Scallops!! Looks scrumptious!!! This looks very tempting and so sophisticated on those beautiful plates! Is there going to be a more detailed recipe somewhere? PIC – I am hooked on seafood, It’s been scallops, shrimp, and mussels lately. Thanks for stopping by! Merisi – I am happy to post the detailed recipe here. It is forthcoming. This recipe is a winner! Bring balsamic vinegar to a boil and reduce to syrup consistency. Reserve. Bring 2 quarts of water to a boil and season with salt to taste. Break one head of cauliflower into small equal pieces, reserving 1 cup of florets for garnish. The garnish florets should be blanched for 60 seconds in the boiling water and the put in an ice bath. Drain and set aside. Cook the other cup of florets in the boiling water until tender, strain and shock in an ice bath as well. Strain and place in a saucepan and cover with the cream and cook for 8 minutes. Purée and put through a fine mesh sieve. Warm 2 sauté pans over medium heat. Add olive oil to one pan and heat until it just starts to smoke. Season scallops with salt and pepper and add to the pan. Only do 4 (1 serving) at a time. Cook approximately 1 to 1 ½ minutes per side. (depending on the thickness of the scallop). You want a little color to the first side before turning. In the other pan add butter and cook the butter until it starts to turn brown. Add reserved florets, cook for 1 minute. Add capers, almonds, raisins, season with salt and pepper and heat through. Warm 4 plates. Put a small circle of cauliflower purée in the middle. Add ¼ of the caper, raisin, almond mixture to the middle of each plate. 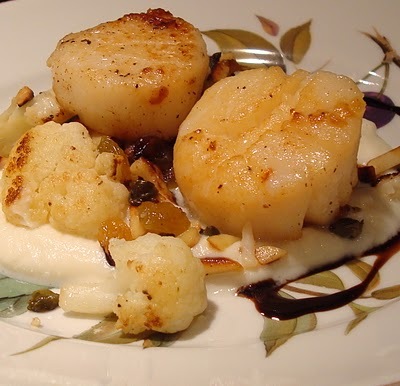 Add four scallops to each plate and garnish with chopped parsley. Drizzle balsamic reduction around the plate and a little evoo as well. We dined at Redd last month and I haven’t been able to get this entrée out of my mind since. Many thanks for the recipe, can’t wait to try it!